MEDFORD — In 1946, Yuri Dojc was born in Czechoslovakia. His parents were Jews who had managed to hide from the Nazis during World War II. In August 1968, Dojc was in London when Soviet tanks entered Prague. His parents urged him not to return. A year later, he emigrated to Toronto, where he became a successful commercial and fine art photographer. In 1993, his homeland was split into the Czech Republic and Slovakia. Dojc started working on what would become “Last Folio” in 1997, after returning to Slovakia to attend his father’s funeral. The show runs through Dec. 6 at the Tufts University Art Gallery. Dojc met a Jewish woman at the service who had been at Auschwitz. After the war, she had sought out other Holocaust survivors. Dojc began accompanying her to meet these now-elderly men and women to take their portraits. “Through their stories I’m getting to that of my parents,” Dojc has said. Twenty-eight of these photographs make up the first part of “Last Folio.” The portraits are in black and white, unmatted, and framed in black. That might sound severe, even funereal. Except that these faces are astonishing. Decades of hard use — and the effect of terrible memories, surely — have seamed and wrinkled them. But in each face one sees such character and indomitability, however ravaged. The sense these portraits convey of the toll time takes is even more vivid in the remainder of the exhibition. Off to the side, a monitor shows a nine-minute excerpt from a film about Dojc’s “Last Folio” project, directed by the British documentary filmmaker Katya Krausova. 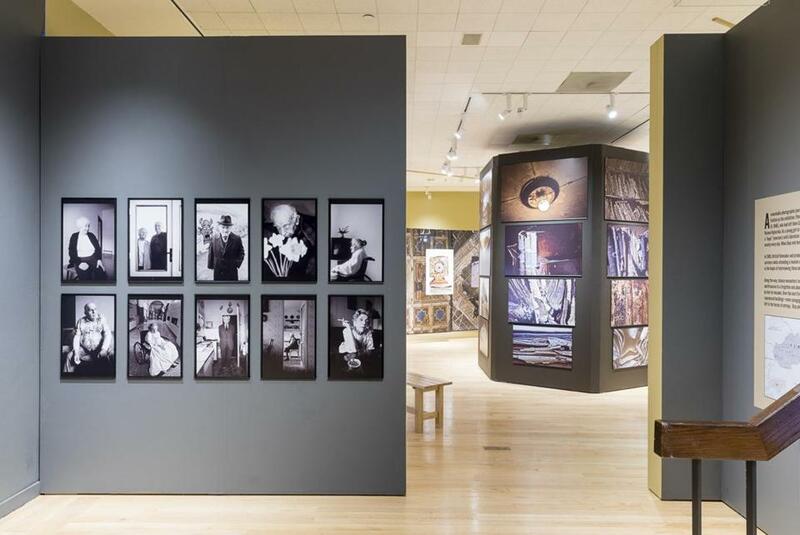 It affords a useful transition to the rest of the show, a striking installation of 35 large color photographs showing interiors and artifacts — fragments of Torahs and books, peeling walls — taken in derelict synagogues, cemeteries, mikvahs. 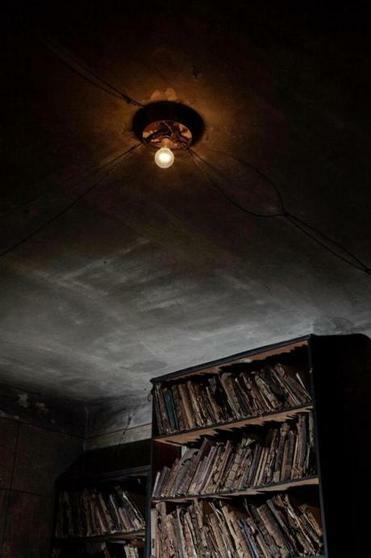 One of the sites is a Jewish school that was abandoned in 1942. In 2006, Dojc learned of its existence from a Protestant churchman, who’d kept watch over it since its abandonment. Fifteen of the photographs hang from the ceiling, giving them a physical as well as visual presence. Just as the absence of mattes and frames makes the portraits seem less mediated, so too with these pictures being freestanding. Walking around them is a bit like going through a doorway to enter the world they show — a world even more distant in time than space. The experience of seeing “Last Folio” is, in a very real sense, transporting. “I found something I did not even know I was looking for,” Dojc has said. That feeling of unexpected discovery fills these images. In them, decrepitude and destruction merge with survival to become something greater than either. That something partakes equally of accusation (“See what was allowed to happen”) and consolation (“See what has managed to survive”). Too vibrant for elegy, too subdued for celebration. Dojc’s photographs capture the mute eloquence of that which endures. He and Krausova will be in residence at the Center for the Humanities at Tufts from Oct. 5-9.